I look forward to the hot, long, lazy days for solace, comfort, ease and freedom. With sand in the car, sunburned cheeks (and the countless tubes of sunscreen absorbed in the planned avoidance of them), barbeques, bug bites, kite flying, chilled chardonnay, summer is perfect. Our kids, Jake and Ellie, get their multi-colored markers ready to create the annual Summer Fun Adventure list, filled with promises and dreams of water parks, museum jaunts, sleepovers, camp outs, and pool parties. Ellie expectantly waits for my nod of approval that verifies that yes, stone fruits are now in season and we may obsessively begin over-filling our farmer’s market baskets to savor the ripest, sweetest, unapologetically drip-down-your-arm-juicy apricots, nectarines, peaches and plums. Summer is simply the best time of year. But this summer is different. I am busy and burnt out. The thought of making another list – even for FUN! SUMMER! ADVENTURES! (three of my very favorite words), feels not only daunting, but simply untenable. The words, “I can’t” keep falling out of my tired lips. I can’t enjoy it right now. I can’t postpone these deadlines. I can’t plan for tomorrow; I’ve got to get through today. I can’t. I’m sorry, but I really can’t. Crestfallen, I sit here shaking my head. This is not how it’s supposed to be. Not in summer! This kind of detachment is reserved for fall or winter when I know I’ll get through it but I don’t really care. I notice my back is to the window, and I’m trying to tune out the sounds of the birds chirping in the trees because I really need to focus. And I love birds chirping in trees. No. This is definitely not right. It breaks my heart not to love this summer, and I’m trying as hard as I can to be here in this particular moment even though, quite honestly, I’d rather be at the beach. I take occasional breaks and optimistically buy a sundress. I load the freezer with popsicles and talk to anyone who will listen about the fun I’m going to have (after I finish these projects). I need an opening. Something to savor other than the incredible bounty of produce. I need a break, if not from the work or the pressure, but from my obsession with summer-isn’t-quite-working-for-me-can-I-please-speak-to-a-supervisor-thanks? Jake has been a camper at the same day camp every summer since before he could tie his own shoes. While his friends are off having their experiences at sports camps and sleeping away for weeks on end, Jake contentedly returns to the place he knows and loves and the bus that takes him there. We rush to the bus stop, and as the kids load on, buckle in, and do whatever they do that the parents aren’t allowed to see in the magical transformation between home and FUN! SUMMER! ADVENTURE! I spy my boy in the window. He sits alone here, his sister occupied with her own friends; his friends will arrive at camp on other routes. He spies me, too. He waves to me with one finger. I wave back. I mime a kick line with my index and middle fingers. He does the same. We hang loose, ok, make hearts, bunny ears and tiny llamas with our fingers at each other in our silent connection in the parking lot. I’m unselfconscious, totally absorbed and completely smitten with this child and this moment. And then another mom notices me as I’m making caribou antlers on my head at Jake and waiting for his response. I blow a kiss and he catches it with his own. “I think that’s the sweetest thing I’ve ever seen,” she says. The moment is sweeter than a sun-ripened peach. I nod, knowingly. I tell her this is the best part of my day. And then it happens the next day, and the day after, and I notice that I’ve fallen in love with summer all over again. Karen Pery makes successful people awesome leaders and has a lot of fun doing it. 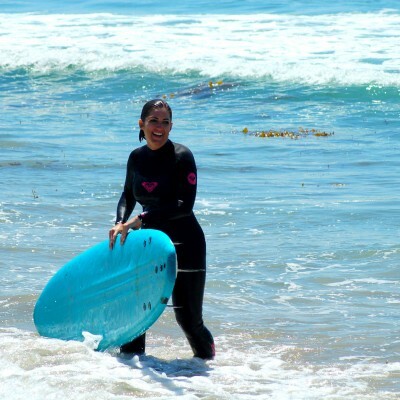 Right now, she is obsessed with bringing an incredible group of professionals together to learn leadership through surfing at the Into the Fire Sessions Surf + Leadership retreat on August 10 in Malibu. It’s all she talks about, except when she’s talking about building professional communities, her horses and dogs, her amazing family, or the excellent adventures she creates for her coaching clients. Or summer. Or Paris. I love, love, LOVE noticing moments like this, Karen (great name, btw) – and when I’m not noticing them myself it means the world to my heart for someone to point them out, as you’ve done here!! Thank you for this!